My twelve year old daughter loves mythical creatures. She can spend many hours drawing them. This year she wanted to be a Phoenix which is a colorful bird often associated with the sun. It is said to have the power to be born again from the ashes after a combustible death. I started the costume with a plain gold Venetian mask. I put a crest of feathers lined with gold cording on top of the mask for a dramatic look and jewels on the beak and face. The elastic was added to the mask to be strong enough to stay put. The wings were the most time consuming. 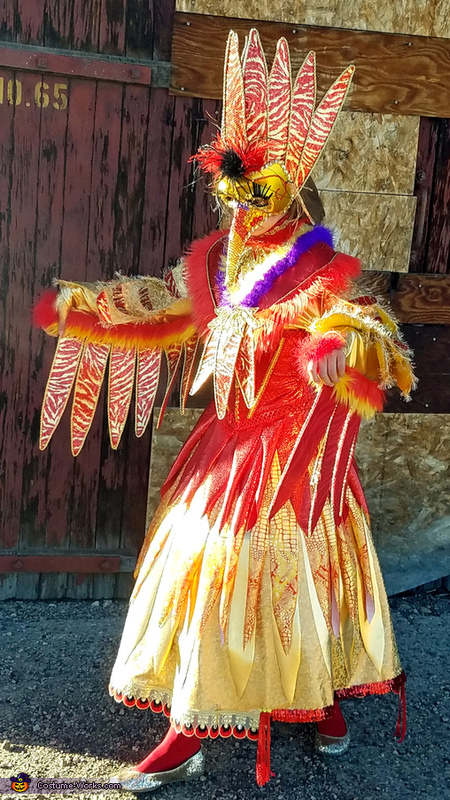 I cut rounded feathers for the top of the sleeves lined with sparkle gold yarn and tiger striped feathers on the bottom to match the mask. I sewed a corset with gold grommets and laced a bright yellow string through the back. The skirt was decorated with red and then orange fading to gold feathers. The bottom is lined with a bird trim from India to match the black in the mask. There is a hoop skirt underneath the skirt to create more volume. I put a little purple accent in the front and head for a more royal appearance. I used yellow and red fur for lining some of the costume. I also made a choker which was attached around her neck with Velcro. I’m not sure how long it took as I worked on it a little at a time (around a month). The cost was about $90 for materials. It was fun to make! She won her school contest and she got many smiles and reactions to her costume. Just a funny story – I tell my daughter to only go to houses with the porch lights on. There was one house that did not have a porch light, but had every indication that they were still celebrating Halloween. There was a line of intricately carved pumpkins, moving ghosts projected on their garage, and a woman sitting on the porch swiveling from side to side like she was on a swivel twist disc. I watched my daughter as she walked cautiously into the yard and asked, “Is this house available?” Then a big spooky butcher pig jumped out of the trees, while another spook took her bag, and yet another 11 foot monster came around the corner and surprised her. The creepy woman on the swivel gave her candy and the spooks returned her matching candy bag. After all was said and done, she was invited into the house so they could get a picture of her costume. She said that was the best trick or treat house she ever visited in spite of no porch light!